Until now I hadn’t climbed a real mountain in any real sense, so I spent several weeks looking forward to tagging along on a trampey club alpine trip to Mt Travers, in Nelson Lakes, to see what was involved. The intended route wasn’t too technical for my recent snowcraft training, and Sharron (the organiser) was nice enough to let me join in. Our plan was something I wasn’t completely used to. Until now I’d spent most of my time tramping rather than climbing, and tramps (at least within the club) tend to have an emphasis on trying not to visit the same place twice, if at all possible. Thus it felt strange to suddenly be embarking on an adventure where the stated goal was simply to get to the top of something and get back again. 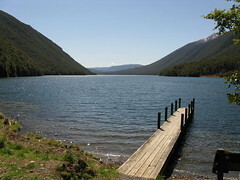 Location: Nelson Lakes National Park, Lake Rotoiti. People: Sharron, David, Marie, John, Lorraine and me. 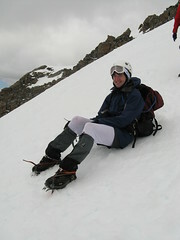 Huts visited: Coldwater Hut (0 nights), John Tait Hut (2 nights). 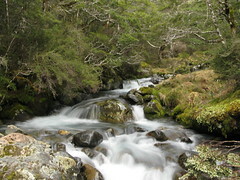 Route: Water taxi from St Arnaud to Coldwater Hut on Saturday morning, then walk to John Tait Hut. 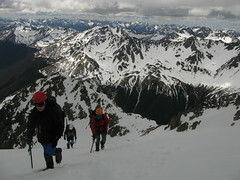 Climb to summit of Mt Travers on Sunday via Summit Creek basin, then back to John Tait Hut. Walk back to Coldwater Hut on Monday and return via water taxi. This post is a trip report. You can find other trip reports about other places linked from the Trip Reports Page, or by browsing the Trip Reports Category. Having arrived via the evening ferry sailing and a shuttle to St Arnaud (courtesy of Nelson Lakes Shuttles), we stayed at the Kerr Bay campground, alongside the two club Medium-rated trips who were aiming for Lake Angelus. The only disturbance overnight was a loud thump at 5am — the consequence of a certain person from our group happening to roll off a nicely prepared (but narrow) make-shift bed. Even though nobody else had been considerate enough to sleep in exactly the right place to break the fall, there was no serious injury. As the stars slowly faded from the night sky, a single bellbird woke a noisy chorus of echoing bellbirds, and morning had arrived. The walk around Lake Rotoiti from St Arnaud to Coldwater Hut typically takes about 2-3 hours, but being the more fitly-rated club trip (which I’ve noticed correlates with more practical decision making), we spent 10 minutes on the water taxi instead, leaving St Arnaud at about 8am. After a brief stop to re-pack things, we headed south towards John Tait Hut, where we were planning to base ourselves for the next couple of nights. Nelson Lakes National Park, along with much of the rest of New Zealand, had been clobbered by the bad weather a couple of months before we arrived. Sharron and David had been here recently. On that occasion their travel had been hindered by a lot of tree-fall, and we were concerned it might be a problem again. Shortly before we arrived, however, someone from DOC must have shown up with a chainsaw, and DOC’s chainsaw warriors had covered all the way to John Tait Hut. 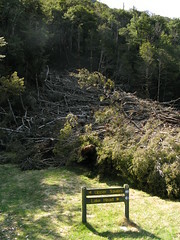 As we reached a 3 metre high pile of broken trees that had been swept down the hillside to within metres of the front door, we found a tidy channel had been cut through it meaning we needn’t even step into the river. The end result of all this was that our predicted arduous 8 hour grapple over, under, around and through fallen trees had become an arduous 4 hour grapple along a straight and mostly flat track in bright sunshine. During this time we saw one entire fisherman and three entire Chezkoslovakians who were walking out. None were very chatty. My shoulders were starting to ache after all that hard walking, and I welcomed it. The hut was empty of people when we arrived, but 6 sleeping bags were inside and various items indicated that another climbing party was nearby. With nothing scheduled for the afternoon, we sat down for lunch before Sharron, David and Marie went for a wander further up the track to survey what we’d have to expect tomorrow. John, Lorraine and I, meanwhile, lazed around in the sunshine all afternoon. We explored what used to be the clearing directly in front of the hut before it had been filled with debris by an August avalanche that had forced a new path through the trees, narrowly missed obliterating John Tait Hut by a matter of metres, and continued over the Travers River to deposit a lot of large trees on the far side. As somebody had noted in the hut book, it’d be fair to say that there would not be firewood problems for a while. We later found that another avalanche of a similar size had come down 2 minutes behind the hut, so the hut’s placement seemed to have been somewhat lucky. The dunny, of course, was tipped into the river at the time. Since then its flattened corpse has been returned to the river-bank for all passer’s by to gawk at, and a new one has been installed on the other side of the hut. Needless to say for the rest of our stay, there was no shortage of jokes. The remains of the dunny. On a more serious note, very few people had recorded visits since mid-August, probably because DOC had been telling everyone to stay away. A party from Upper Hutt were present during the bad weather in August and had written some comments that sounded fairly desperate, stating that although the track was impossible to follow after 5 days of constant snow, they were still going to try for Coldwater Hut with 2 days of food but no shelter besides sleeping bags. The humour gets drained from the moment when somebody in such circumstances signs off by writing “Love to kids. Good luck us.” It’s a good thing that an obliterated toilet was outside to provoke our shallow humour, or we might have spent some time mildly depressed. Sharron, David and Marie returned, bringing with them the other party of climbers whom they’d met somewhere up the track. All 6 of them were also from Wellington, and doing exactly the same thing as ourselves. If we’d left a day earlier, we might have been following them (or them us) for the entire trip. We exchanged stories and jokes, watched them argue about white rice or brown rice, cooked and ate our own dinner, and went to bed at the late hour of 8pm. The base of Summit Creek. Sharron and David’s intended route up Mt Travers was the one they considered the easiest and most straightforward, which is to keep going south of John Tait Hut until Summit Creek, then follow the creek up into a wide basin underneath the peak. (There’s a nice bush-bashing route which starts on the true left.) We’d then follow a route up into a space between Travers Peak (2338) and another spot height (2127) to the north-west, before walking up onto the summit. A few weeks before the trip, we’d had a club talk by Lee Davidson, who’d spent her PhD examining why people like to do crazy and dangerous things like climbing mountains. One of the main things she found, at least according to my selective listening and exagerrative comprehension abilities, was that people who climb mountains like to do so for important, deep and meaningful reasons, and tend to resent all the other people who only have superficial reasons. Not having been up an oversized rock before, I wasn’t sure if I’d make the grade as a true mountaineer. I was really hoping I’d find something deep and meaningful in the whole thing so I could be as cool as everyone else. Naturally the safest way to avoid looking like a superficial idiot is to do what everyone else does, so I became concerned as we started walking at 6.30am on Sunday morning and I noticed that I was the only person wearing shorts without thermal long johns. I felt vindicated in a small way 30 minutes later when everyone else started complaining about being very hot, but if wearing trendy looking long johns was going to be one of the deep and meaningful elements of climbing mountains, I knew I was already in trouble. The 6 of us reached Summit Creek at around 7.20’ish, and from there started walking up-hill. 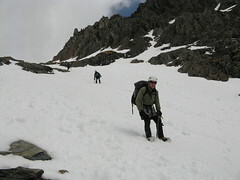 By 8am we had out crampons and ice-axes. As I carefully studied the people who knew more about how to get up mountains than I did, I felt as if I was beginning to get the hang of things. At long last, once we reached a decent amount of snow, I had a practical reason to wear my new snow goggles which weren’t just as fashionable as the box they came in claimed they were, but even more-so than the regular sun-glasses that everybody else had. The real turning point however, was when we stopped for a few minutes and I had a chance to re-arrange my attire, pulling on my trendy long johns under my shorts. Finally, I felt like a real mountaineer, and from that point on I think I really “got” it. I found myself able to genuinely understand and appreciate the deep and meaningful aspects that Lee had been conveying were so important for people who climb mountains. By now we still hadn’t made it far in the specific terms of actually getting to the top. I was already content with my day’s accomplishments of having been able to use a heap of impressive looking gear. With Sharron, David, Marie, Lorraine and John all being mountaineering-type people, and also looking pretty cool as they wielded at least as much stuff as I did, I assumed that everyone else was content for similar reasons. We probably could have just turned around there and then, and been completely satisfied. With the superficial expectation of outsiders that mountaineers like to get to the top of things from time to time, however, there was an un-spoken agreement sensed between everyone that we should at least give it a go. It was a nice day after all, and we had some time to get there and back, so we might as well use it. At one time there had been doubt about whether we’d left early enough for the snow to stay hard enough to easily walk on, but it was a non-issue in the end. The clouds that flowed over and shielded direct sunlight probably helped. We also had steps to follow from the (probably more superficially-inclined) people from yesterday, making things easier. Views of the surrounding mountains improved as we got higher, but the most dominating sight was the view straight back up the Travers River, where we’d walked up the previous day. We stopped on several occasions to laze around, chat and and re-group, reaching the area west of point 2127 at about 11.30am, and I guess we were lucky that this was about the only area where we noticed any wind. From here we hopped up to the summit, reaching it between about 12.30pm and 1pm to be surrounded by some rather nice mountain vistas in all directions, coupled with far-away dark clouds circling us on every horizon. This being my first time in such an alpine area at a snow-covered summit, it was also my first experience walking along a short piece of snow-covered ridge, which on this occasion led to the summit. I was initially uncomfortable with the apparent bluffiness of it, but David, Sharron and Marie all stepped out with confidence. I guess it’s something you get used to judging with experience, and I was glad I could follow in their footsteps. Getting down was fast. We stopped for a lengthy lunch just before 2 on a nice rock somewhere below point 2127. The clouds overhead weren’t as dark as we’d seen from the summit, and I guess part of that greyness from the top might have been an illusion of looking at the towards the horizon (where the atmosphere is thicker) when we were higher up. The rest of the afternoon involved running, sliding and (occasionally) sinking. When a certain person accidentally had their foot trapped underneath something for about 5 minutes as the rest of us stood around, we all learned that other people’s misfortune can be entertaining. By about 3.30pm we were back at the bridge at the base of Summit Creek, and made the final walk back to John Tait Hut more interesting by dropping down for a visit to Travers Falls. It worked out to a day of ten hours, but with a lot of relaxing stops. We found a quiet Australian chap back at the hut, who’d been fishing outside for much of the day. His girlfriend returned from a run to Cupola Hut shortly afterwards, and we chatted about walking and climbing and so on before having dinner and going to bed. Mt Travers on Monday morning. With a scheduled 2pm water taxi collection, we left at about 8.15am on Monday morning. Half way back, David pointed out the high reflectivity of our footsteps in the snow up to the top of Mt Travers, which had never occurred to me would be visible. It was co-incidence that we met the tail-end of one of the other club trips on their way back from Lake Angelus — they were on their way over the Travers River bridge, intending to walk back to St Arnaud via Lakehead Hut on the far side, and we caught glimpses of them over the river several times along the way. For ourselves and our more fitly-rated trip, though, we had a pre-paid boat to catch. After another difficult 4 hour slog thorough the tormenting bright sunshine, we grappled our way along the deceptively flat track back to Coldwater Hut, and finally arrived at about 12.30pm for lunch. The reward was some intensive lying in the sun as we waited for our water taxi. It was a nice experience for my first genuine alpine trip, although I guess it could easily have been more dramatic if the weather hadn’t played so nicely. Best of all, I felt that I could now fully appreciate being a mountaineer, and I hope to do it again. I guess I found the half days of flat-track walking to be quite hard on my shoulders. The climb on Sunday was awesome though, and the scenery from the top was fantastic. Definitely well worth it. Lake Rotoiti from Coldwater Hut. 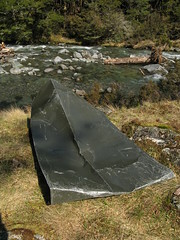 This entry was posted in tramping and tagged bagged:coldwater hut, bagged:john tait hut, mountaineering, nelson lakes, tramping, wellington tramping and mountaineering club, wtmc newsletter. Bookmark the permalink. Hello. I just stumbled across your page and had to let you know how much I enjoyed it. 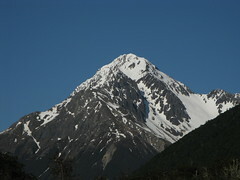 I am almost 65 now, but I climbed Mt Travers with a couple of mates in 1971 when we were all in the RNZAF at Woodbourne. Don’t think I’d have much hope now-a-days, but your descriptions and images have been an incredible thrill for me. In those days I almost lived in the mountains up there in the weekends, and everything was much more primitive than it is now. Some awesome memories re-ignited by your web page. My grateful thanks. Thanks Peter. It’s a pleasure. I enjoyed this write up as well. You are compiling a real treasure trove of memories and great information. Very cool that Peter above found you. I read your comments over at Markus’s place in regards to the definition of a tramper. Very well reasoned, researched, and thought out. Thought I would recommend a book I had recommended to me by Bob Mckerrow called Mountains of the Mind, by Robert MacFarlane. While it deals with how mountains and high places historically began to attract people to climbing, I think the same theories can generally be applied to tramping as well. Anyway just thought you might find it interesting. Happy tramping! Thanks Robb. I’ll keep an eye out for Robert’s book. I coincidentally just finished reading Aat Vernon’s Mountain Solitudes when I was out tramping last weekend, which I picked up partly as a consequence of having seen you suggest it in the past. It was a good read, and I might write something about it in future. Text of Windy Hilltops	(not including comments) is licensed under a Creative Commons Attribution-Noncommercial-Share Alike 3.0 New Zealand License. Please ask me if you want to use photographs for some reason, or if you want to use the text in some way not covered by the license.